BI – What Is It and Do I Have It? Although the title suggests that BI could be the newest global pandemic, thankfully it is a mere abbreviation for "Business Intelligence," a buzzword commonly thrown around in business and software circles. This article will break down the Six W's of Business Intelligence and help you understand how the right tools can harness its power to benefit your business. Business Intelligence, or BI, refers to the tools and systems used to collect, store, organize, access and analyze data for an organization. A common misconception is that business intelligence is a fancy term for financial reporting, when in fact, business intelligence represents a much larger set of information and functions. While financial reports (Profit & Loss, Balance Sheet, Statement of Cash Flow etc) comprise an important part of business intelligence, they also refer to a much more limited scope of information. Business intelligence represents information from all aspects of an organization including inventory, distribution, payables, receivables, customer profiling and more. 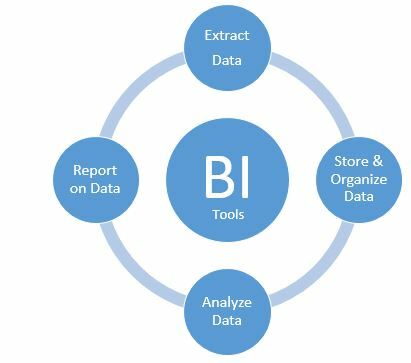 Additionally, business intelligence requires systems to perform several tasks prior to generating reports, including data mining and extraction, organization and statistical analysis. Why should you care about business intelligence tools? Software systems create and maintain a wealth of information on almost every detail of a business. Even if an out-of-the-box report or inquiry does not exist, built in reporting tools make it possible for users to generate an unlimited number of custom reports, dashboards and other useful presentations of critical figures. An organization can only benefit from the information contained in its system to the extent that it can obtain the data in an efficient, organized, and understandable fashion. These requirements reveal the importance of effective business intelligence tools and the potential consequences of underutilizing or lacking such tools. Ideally, business intelligence tools help companies to streamline operations, identify areas of weakness, inform decision making and cut costs. Conversely, companies that are unable to access or interpret their business intelligence, may make costly mistakes based on inaccurate, missing, or misinterpreted data. Strong business intelligence tools put the power back in the hands of the individual user. In many older, outdated systems, companies had to contact IT or an outside service to obtain data whenever their needs were not met out-of-the box. Alternatively, users would be required to learn complex reporting tools like Crystal or query language to pull information. Even with data in hand, companies would then have to spend time manipulating spreadsheets and creating graphics to present the information in a logical manner. Undoubtedly, this cumbersome process would discourage businesses from expanding their data analysis and reporting practices. In contrast, a modern system like Sage 300 contains multiple business intelligence tools like Sage Intelligence, the Sage Portal, and the new web screens in 300c that allow users to easily pull and present a variety of data in countless ways. While users can be restricted in WHAT information they have access to, these tools give them the ability to obtain, update, manipulate, visualize, and display information in more ways than ever before. With users empowered to obtain information for themselves, the costs and inefficiencies that were previous constraints to frequent data analysis have all but disappeared. 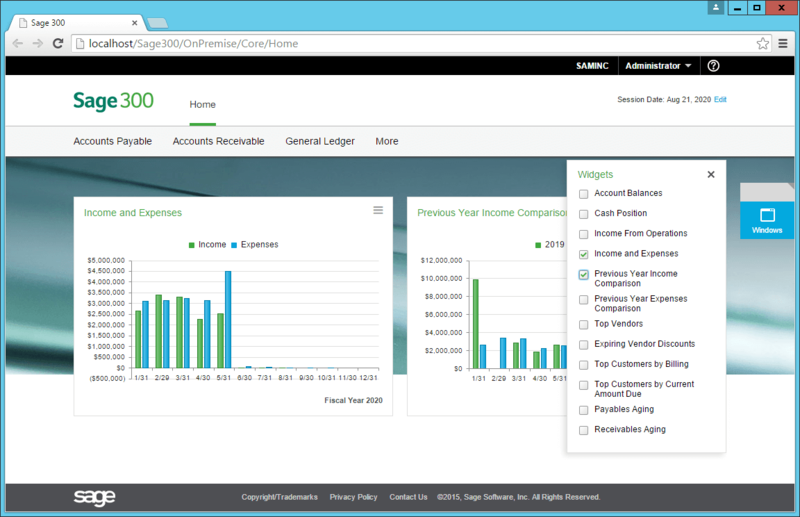 Individualized by user, KPI widgets on the new home screen of Sage 300c provide an instant snapshot of the company’s financial position and can be refreshed with one click. Other tools, like Sage Inventory Advisor, provide companies with a graphic view of their sales and inventory levels in addition to standard reports. Drill down features in the graphics allow users to quickly access detailed information in a more traditional presentation. The Inventory Advisor forecasting tool allows for dynamic predictions where users can manipulate data endless times to model various demand scenarios and stock requirements. The efficiency and accessibility of these tools ensure that the incentive for keeping abreast of trends and anomalies in data are higher than ever. Companies no longer need to choose between the costs of action (inefficient, expensive data extraction process) and the costs of inaction (delayed or nonexistent reaction to information) as they are able to make decisions rapidly based on the latest information available. Imagine a pipe bursts in your building. Although the ideal situation would be that the pipe stayed intact, most people would agree that finding out about the leak in the first 5 minutes would lead to a better outcome than discovering it after a long weekend. Sage Alerts & Workflow is a powerful tool that can act as the eyes and ears for your database. Alerts can be emailed to specific contacts according to custom triggers when certain conditions are met. The reports module can also be configured to email standard or custom reports on a set schedule making it significantly easier for users to stay informed. Sage Alerts exemplifies the importance of business intelligence tools that can deliver data in time for informed, deliberate decision making. Excel is one of the most basic and affordable business intelligence tools in use. All reports in Sage 300 are easily exported to a spreadsheet and users are able to manipulate data fairly easily without advanced knowledge of the software. Excel also contains some basic tools to group data including subtotals and pivot tables. The Financial Reporter (FR) tool in Sage 300 operates through an Excel add-in that allows template reports to be refreshed with data selected via parameters in Sage. Although many companies utilize FR to print basic financial statements, the templates are confusing to edit and newer versions of Excel can experience errors with the add-in. These and many other concerns with external spreadsheets send businesses in search of the next level in business intelligence reporting. Out of the box, the newest versions of Sage 300 provide several built-in business intelligence reporting tools that read from the Sage 300 company database. The Sage Intelligence Report Manager, Designer, and Connector can be run from within Sage 300 and come with many free templates for basic financial, operations, sales and marketing reports and dashboards. The Connector allows you to incorporate information from multiple databases including those linked to applications other than Sage. The Sage Portal and newly released Sage 300c provide cloud access to KPIs, custom views and dashboards. All of these tools are available for free or at minimal additional cost to Sage 300 clients. 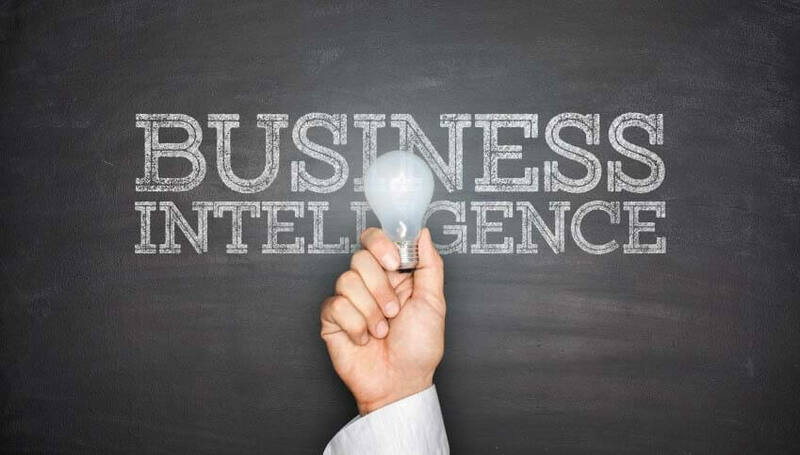 Companies with the ability to invest in business intelligence tools should evaluate Sage Fixed Assets, Sage Enterprise Intelligence, Sage Alerts and Sage CRM to capitalize on their ability to identify and correct inefficiencies, reduce costs, streamline operations and maximize profits all through the power of information. The right business intelligence tools should make obtaining up to date, accurate and understandable data as easy as a walk in the park. If your company’s efforts to capitalize on business intelligence are more reminiscent of an uphill hike, contact Equation Technologies to find out how we can help you to harness the power of your data. Just leave your name below and a representative from Equation Technologies will contact you shortly.